The illegality, immorality and inhumanity of the U.S. Naval Detention Center at Guantánamo Bay, Cuba is the focus of a special presentation on Thursday, August 1, 2013 at 7:00 PM in the Buchan Room, First Unitarian Church, 1226 SW Salmon Street, Portland, Oregon. After being incarcerated with no charges and no trial for more than a decade, subjected to inhumane conditions and treatment considered by international observers to be torture, 166 detainees from more than 25 Middle Eastern and Asian countries remain in captivity at Guantánamo. An examination of this horrendous reality will be provided by experts with intimate knowledge of conditions at the infamous detention center. **Steven T. Wax, chief Federal Public Defender for the District of Oregon, is considered one of the premier defenders in the nation with expertise in habeas corpus. He oversaw a legal team representing a number of the kidnapped Guantánamo prisoners, including Sudanese hospital administrator Adel Hamad, and successfully defended Portland lawyer Brandon Mayfield who was arrested in the U.S. global “war on terror” as a material witness to bombings in Spain based on the FBI’s grossly mistaken fingerprint identification. A graduate of Harvard Law School and a former law instructor at Lewis & Clark College, he is author of Kafka Comes to America: Fighting for Justice in the War on Terror (Other Press, 2008). **Laura Sandow, a U.S. Navy veteran, was serving at the Guantánamo Naval Base when the first detainees were brought there from the Middle East and Asia in 2001-2002. Her story is featured in comic strip form in the June 2013 issue of Symbolia, a new electronic magazine designed for tablet. **S. Brian Willson, former commander of a security unit in Viet Nam, trained lawyer and criminologist, and long-time peace activist, recently participated in a hunger strike in Portland in solidarity with Guantánamo hunger strikers. 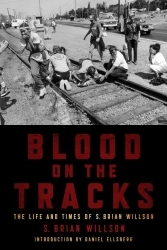 He is author of Blood On The Tracks: The Life and Times of S. Brian Willson (PM Press, 2011). **Portland journalist Sarah Mirk will moderate the discussion. Suggested sliding-scale donation of $5 to $20. No one turned away for lack of funds. Doors open 6:30 pm. The event is cosponsored by Veterans For Peace Portland Chapter 72, First Unitarian Church of Portland’s Social Justice Council and Economic Justice Action Group…. [much longer list to come]. This entry was written by brian, posted on at 10:17 pm, filed under Brian's Blog, The Most Dangerous of Rogue Nations: The United States, Terrorism & Homeland Security. Bookmark the permalink. Follow any comments here with the RSS feed for this post. Post a comment or leave a trackback: Trackback URL.